Gladys Nunery PS #29 School has 2 trailers which have not been in use for almost 2 years, are just sitting there and could possibly be very dangerous because of the location they are in. The Trailers were used for the Pre - K students at one time. Currently the children are in the building. The trailers were supposed to be removed, with multiple emails and going to the meetings asking for help, we were told that the trailers in the courtyard would be priority. After over 2 years of asking the status, we have come across some dangerous situations which needs to be addressed immediately. The location of the trailers is placed on the Grant Avenue side of the school and close to the gate which is left open, due to the law. The children are squeezed into a small area to line up in the morning and during dismissal. The space is very limited for recess and dangerous for teachers to bring the children outside not being able to see if strangers are walking through the gate. The school is across the street from a program which attract many addicts and men and women who may have mental issues. This is already a huge problem, having the trailer in front of the gate makes this a dangerous problem. If an emergency breaks out while the kids are in the courtyard, There is no security outside with them, and the doors to the school is locked. So when the weather starts to get nice and warm, I, as a parent, feel uncomfortable for 1 teacher to be out side with about 30 elementary school children. Not only is the trailer blocking the view of the open gate, it is also falling apart. 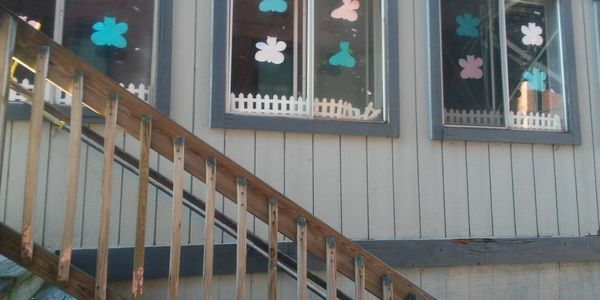 The children run up and down the stairs which have holes. I am pretty sure animals are living inside and it is very possible for homeless men and women to sleep in there or possible use their drugs which can cause a fire. This is not only bad for the staff and students of this school, it is worse for the neighborhood. The drug traffic is very high in our neighborhood and any unused entity can be broken into and used for housing or any malicious activity. Yes there is cameras in the courtyard, but at night you can not see very well. We need for the Business Administrator of the Jersey City Board of Education to think of this as a unsafe issue which needs immediate attention, because it has been over 2 years later and all we are getting from her is "I am working on it"! This petition can speak volumes to the Business Admin, Ms Regina Robinson, and possibly get her to understand that her lack of attention regarding this matter could be dangerous.